Gentleman Jim Stacey wants you to fight corruption in Vivec. Go to the Yngling Manor in the St. Olms Plaza to find proof of Yngling Half-Troll's corruption. Find Yngling's Ledger in the basement. 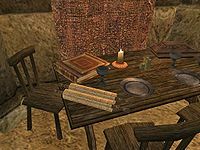 For the second quest in this series, Jim Stacey asks you to find proof of Yngling Half-Troll's corruption by finding and returning a ledger in the Yngling Manor, which is located in Vivec's St. Olms Plaza. The ledger can be found downstairs by some game rats. The basement door is locked and there is a guard at the top of the stairs. Apparently, Yngling has been using money from the Tribunal Temple for his own endeavors. Return the ledger to Jim for his congratulations. After you steal the ledger from the basement you can go upstairs and talk to Yngling about the ledger (use the term corruption). He will then demand you give him the ledger, and, if you choose not to, you can fight him. A key to the basement is held by Star. He can be taunted into attacking you and the key retrieved from his body. If you have started the Exterminator quest from Edryno Arethi in the Hlaalu Canton, then you will already have the key to the basement. If you haven't received that House Hlaalu mission yet, then you can dispose of the diseased game rats as you get Yngling's ledger, completing two missions at once. 10 Gentleman Jim Stacey asked me to bring him Yngling Half-Troll's Ledger which is in Yngling Manor in Vivec. This ledger has proof that Yngling Half-Troll is corrupt. 50 I gave the ledger to Yngling Half-Troll, who promptly destroyed it. 100 Finishes quest Gentleman Jim Stacey thanked me for bringing him evidence of Yngling Half-Troll's corruption. 110 Finishes quest I told Stacey that the ledger was destroyed. He doesn't know that I gave it to Half-Troll myself. This page was last modified on 13 August 2018, at 20:50.